Home Open Source FAQ Why I got this “4 simple steps to get started with OrangeScrum” page? Why I got this “4 simple steps to get started with OrangeScrum” page? 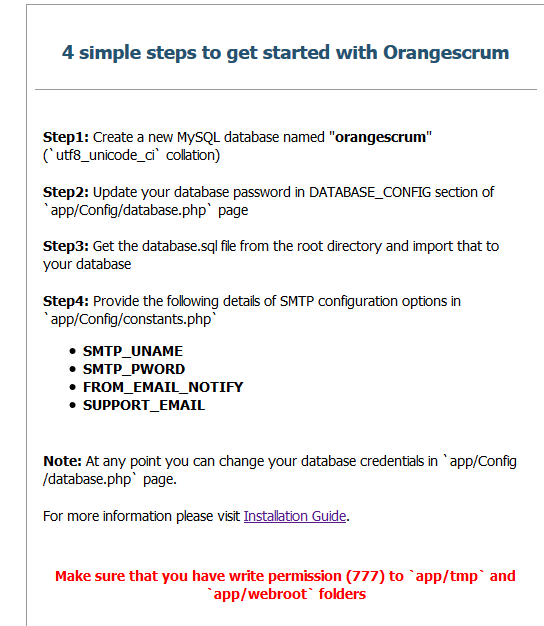 If you see this “4 simple steps to get started with Orangescrum” message, then it seems a database connection error. Check your database connection properly & make sure you have provided the correct credentials. Check the Path of the Orangescrum Folder & make sure you have provided the same path in the Constants.php inside the app/Config folder. Also check & make sure you have write permission (777 or 755) to “app/tmp” and “app/webroot” folders. If you still face the issue, then please contact us for consultant’s help.